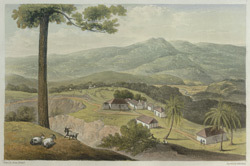 Plate of the Golden Vale in Portland from James Hakewill's 'A Picturesque Tour in the island of Jamaica.' The view has been drawn from the high position of the Spring Valley estate, which was owned by John Steel. The buildings of the Golden Vale and Seaman's Valley estates are depicted, with the Blue Mountains rising in the background. These estates were located on very hilly ground with some peaks rising to 1,000 feet. Few of the buildings had chimneys as the hot climate made it unnecessary to light fires. Only the kitchens and boiling houses had them.